List of Best Women Awardees on the occasion of International Women’s Day in Telangana 2017, Best Women Awardees List,The Telangana government had announced Best Women Awards to 24 eminent women from various fields on March 6 on the occasion of International Women’s Day. 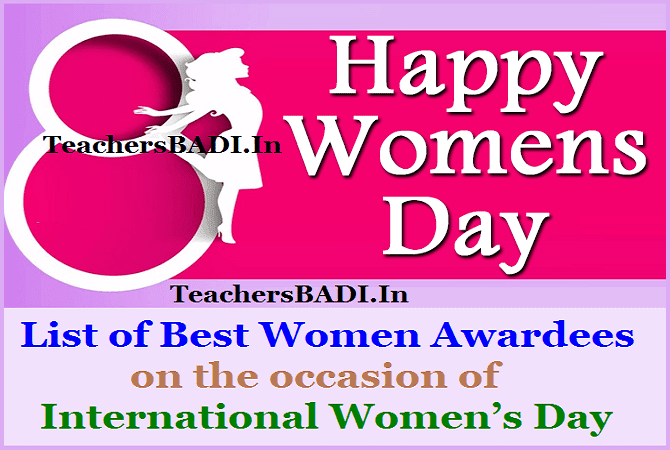 These Awards to be presented on March 8 i.e International Women’s Day. The government has granted special casual leave to women employees on the eve of International Women's Day on the 8th of this month and the government issued orders in this regard and Govt decided to honour them with a cash Award of Rs.1.00 Lakh each along with citation. GOVERNMENT OF TELANGANA,Celebration of International Women’s Day on 08.03.2017 – Presentation of Awards to (24) eminent women from various fields on the occasion of International Women’s Day - Orders - Issued. Smt. Gayathri Wanaparthy Herself being a Visually Challenged person working as a Head Mistress at Z.P.H.S,Wanaparthy. Kumbhala Lakshmi, Sarpanch Ibrahimnagar, Siddipet. After careful consideration of the matter, Government hereby approve the above list of awardees and it is decided to honour them with a cash Award of Rs.1.00 Lakh each along with citation. The Director, Women Development & Child Welfare and the Director of Language & Culture, Government of Telangana are requested to take necessary action accordingly. International Women's Day:*International Women's Day (IWD), originally called International Working Women's Day, is celebrated on March 8 every year. It commemorates the struggle for women's rights. The earliest Women's Day observance was held on February 28, 1909, in New York and organized by the Socialist Party of America. A Women's Day demonstration on March 8, 1917 in Petrograd sparked the Russian Revolution, Declared a national holiday in the Soviet Russia in 1917, it was predominantly celebrated by the socialist movement and communist countries until it was adopted in 1977 by the United Nations. History: The earliest organized Women's Day observance was held on February 28, 1909, in New York. It was organized by the Socialist Party of America in remembrance of the 1908 strike of the International Ladies Garment Worker's Union. There was no strike on March 8, despite later claims. In August 1910, an International Women's Conference was organized to precede the general meeting of the Socialist Second International in Copenhagen, Denmark. Inspired in part by the American socialists, German Socialist Luise Zietz proposed the establishment of an annual International Woman's Day (singular) and was seconded by fellow socialist and later communist leader Clara Zetkin, although no date was specified at that conference. Delegates (100 women from 17 countries) agreed with the idea as a strategy to promote equal rights including suffrage for women. The following year on March 19, 1911 IWD was marked for the first time, by over a million people in Austria, Denmark, Germany and Switzerland. In the Austro-Hungarian Empire alone, there were 300 demonstrations. In Vienna, women paraded on the Ringstrasse and carried banners honouring the martyrs of the Paris Commune. Women demanded that they be given the right to vote and to hold public office. In 1913 Russian women observed their first International Women's Day on the last Saturday in February (by Julian calendar then used in Russia). Although there were some women-led strikes, marches, and other protests in the years leading up to 1914, none of them happened on March 8. In 1914 International Women's Day was held on March 8, possibly because that day was a Sunday, and now it is always held on March 8 in all countries. The 1914 observance of the Day in Germany was dedicated to women's right to vote, which German women did not win until 1918. In London there was a march from Bow to Trafalgar Square in support of women's suffrage on March 8, 1914. Sylvia Pankhurst was arrested in front of Charing Cross station on her way to speak in Trafalgar Square. In 1917 demonstrations marking International Women's Day in Saint Petersburg on the last Thursday in February (which fell on March 8 on the Gregorian calendar) initiated the February Revolution. Women in Saint Petersburg went on strike that day for "Bread and Peace" – demanding the end of World War I, an end to Russian food shortages, and the end of czarism. Leon Trotsky wrote, "23 February (8th March) was International Woman's Day and meetings and actions were foreseen. But we did not imagine that this 'Women's Day' would inaugurate the revolution. Revolutionary actions were foreseen but without date. But in morning, despite the orders to the contrary, textile workers left their work in several factories and sent delegates to ask for support of the strike… which led to mass strike... all went out into the streets." Following the October Revolution, the Bolshevik Alexandra Kollontai and Vladimir Lenin made it an official holiday in the Soviet Union, but it was a working day until 1965. On May 8, 1965 by the decree of the USSR Presidium of the Supreme Soviet International Women's Day was declared a non-working day in the USSR "in commemoration of the outstanding merits of Soviet women in communistic construction, in the defense of their Fatherland during the Great Patriotic War, in their heroism and selflessness at the front and in the rear, and also marking the great contribution of women to strengthening friendship between peoples, and the struggle for peace. But still, women's day must be celebrated as are other holidays." From its official adoption in Soviet Russia following the Revolution in 1917 the holiday was predominantly celebrated in communist countries and by the communist movement worldwide. It was celebrated by the communists in China from 1922, and by Spanish communists from 1936. After the founding of the People's Republic of China on October 1, 1949 the state council proclaimed on December 23 that March 8 would be made an official holiday with women in China given a half-day off. In the West, International Women's Day was first observed as a popular event after 1977 when the United Nations General Assembly invited member states to proclaim March 8 as the UN Day for women's rights and world peace.